She has found a great recipe for preparing homemade chick... vegetable soup. Really love your illustration style! Excellent idea for this weeks illustration Friday. Haha, oh dear. Cool style. That is one dumb chicken. She better turn black and white and blend into the background quick! Beautiful line quality and use of color! 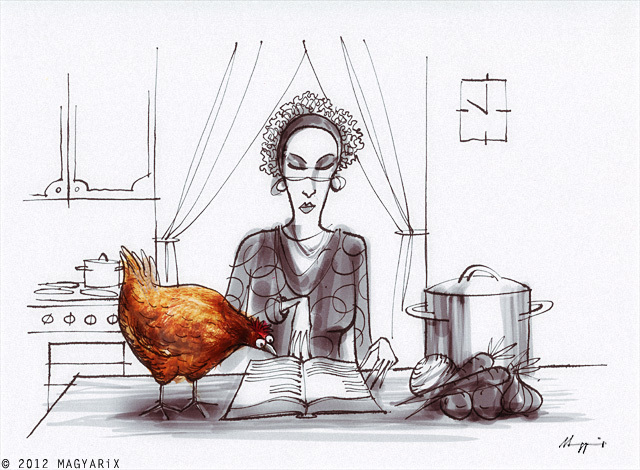 I love your style and especially like the expression on the chicken's face!